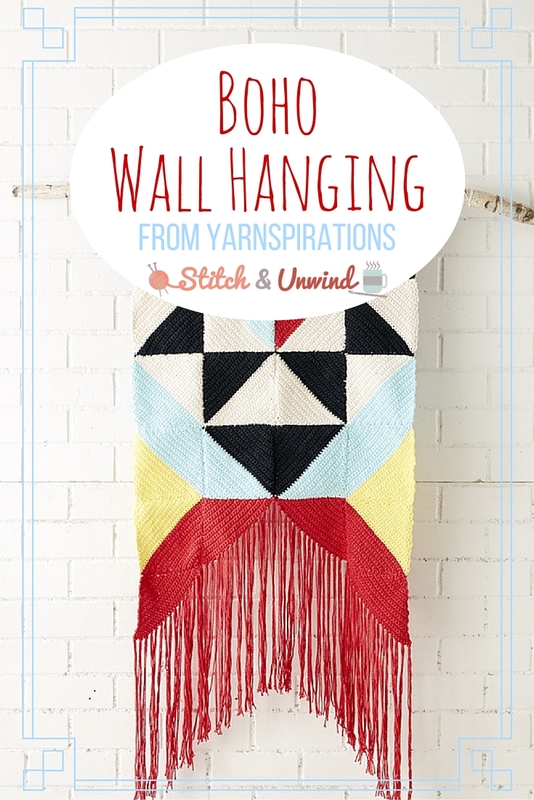 For today’s Free Pattern , we have this gorgeous wall hanging pattern from Yarnspirations! The boho trend is totally in right now, and this wall hanging is really simple to make (although it looks really complicated!) 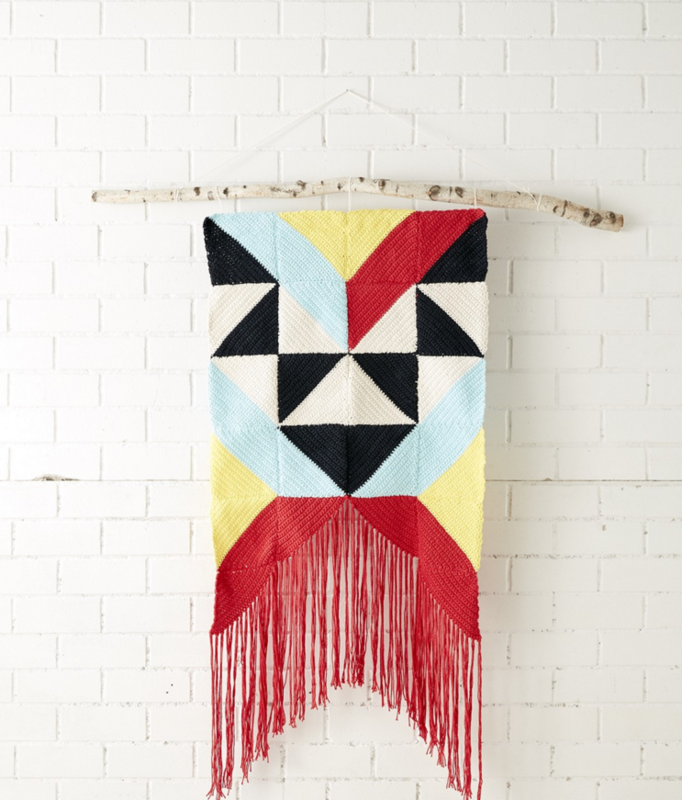 Wall hangings from the store are going for some seriously big bucks right now, but you can learn how to make a wall hanging in no time with this easy knitting pattern . Size U.S. F/5 (3.75 mm) crochet hook or size needed to obtain gauge. Dowel or branch for hanging. Approx 24 x 36″ [61 x 91.5 cm], excluding fringe. 15 sc and 16 rows = 4″ [10 cm]. Square Motif = Approx 6″ [15 cm] square. Make 3 with D as Color 1 and C as Color 2. Make 3 with A as Color 1 and C as Color 2. Make 3 with E as Color 1 and A as Color 2. Make 1 with D as Color 1 and C as Color 2. 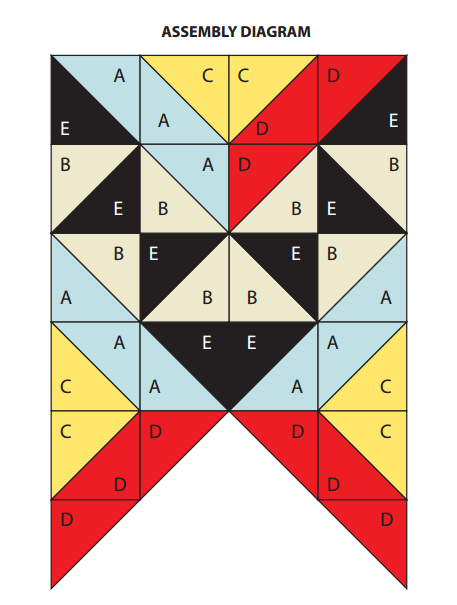 Make 1 with B as Color 1 and D as Color 2. Make 4 with E as Color 1 and B as Color 2. Make 3 with A as Color 1 and B as Color 2. With Color 1, ch 2. **1st row: (RS). 3 sc in 2nd ch from hook. 2nd to 5th rows: Ch 1. 2 sc in first sc. 1 sc in each sc to last sc. sc. 2 sc in last sc. Turn. 11 sc at end of 5th row. 6th row: Ch 1. 1 sc in each sc to end of row. Turn. 7th to 11th rows: Ch 1. 2 sc in first sc.1 sc in each sc to last sc. 2 sc in last sc. Turn. 21 sc at end of 11th row. 12th row: As 6th row. 13th to 17th rows: Ch 1. 2 sc in first sc. 1 sc in each sc to last sc. 2 sc in last sc. Turn. 31 sc at end of 17th row. 18th row: As 6th row. ** Join Color 2. 19th row: With Color 2, as 6th row. 20th to 24th rows: Ch 1. Sc2tog. 1 sc in each sc to last 2 sc. Sc2tog. Turn. 21 sts at end of 24th row. 25th row: As 6th row. 26th to 30th rows: Ch 1. Sc2tog. 1 sc in each sc to last 2 sc. Sc2tog. Turn. 11 sts at end of 30th row. 31st row: As 6th row. 32nd to 35th rows: Ch 1. Sc2tog. 1 sc in each sc to last 2 sc. Sc2tog. Turn. 3 sts at end of 35th row. 36th row: Ch 1. Sc3tog. Fasten off. Work from ** to ** as given for Square Motif. Fasten off. Sew Motifs tog as shown in diagram. 2 strands tog, fold in half and knot into fringe along bottom angled edge of Wall Hanging. Trim fringe evenly. Sew top of Wall Hanging to dowel or stick. Where would you hang this boho home decor? : https://reddit.com/submit?url=https://www.stitchandunwind.com/free-pattern-boho-wall-hanging-from-yarnspirations/&title=Free Pattern: Boho Wall Hanging from Yarnspirations!